Lee Westwood has ruled himself out of the running to be Europe's next Ryder Cup captain, leaving Padraig Harrington as the overwhelming favourite to succeed Thomas Bjorn. Westwood had previously expressed a desire to captain Europe at Whistling Straits in 2020, but told the Daily Telegraph he would "wait until Rome" hosts the biennial contest in 2022 to make his bid for the role. 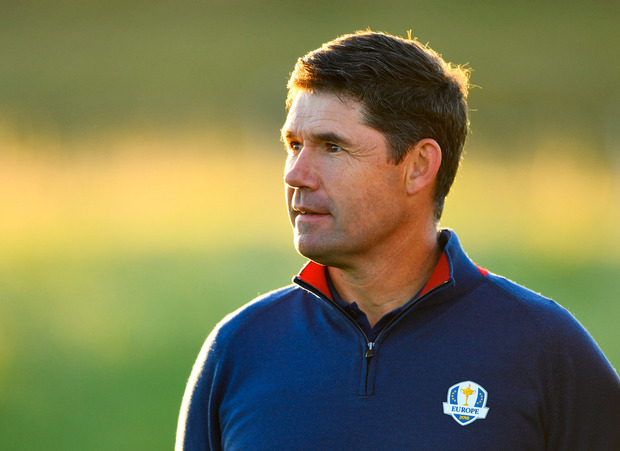 The 45-year-old also told Sky Sports News that he felt three-time major winner Harrington was the "perfect candidate" and "better equipped" to lead Europe's attempt to retain the trophy won in convincing style at Le Golf National, where both he and Harrington were vice-captains. Pelley and a member of the Tour's Players Committee. "There's a process to go through and I think you've got to look at are we covering all bases," Bjorn said ahead of this week's British Masters at Walton Heath, where he will play alongside Harrington and Westwood in the first two rounds. "But I've always said when you've got somebody that's a three-time major champion and has the pedigree that Padraig has and holds the respect of the players that he does, it would be difficult to see him not doing it at some stage, and if he wants it this time around, it's difficult to get around that he is very much the favourite to get the job." The panel is scheduled to meet in December, although Bjorn feels there is no need to rush into any decision. "As much as when we lose, we try and just calm ourselves down, I think we also need to calm ourselves down when we win," Bjorn added. "We've got to let these 12 players enjoy this Ryder Cup and what was 2018 in Paris before we start looking forward to Whistling Straits. "You can make these decisions too quickly and there's plenty of time. I think I found being announced as captain on the sixth of December in 2016, maybe having that role was a little bit too long for me in the sense that you're so eager to get going and there's nothing to get going with. "You feel like you're talking to people that are still coming down from a Ryder Cup that's just happened. The system is not quite there to support you as an incoming captain, so my recommendation is don't make this decision too quickly because there's no point. "You're not helping the incoming captain by making the decision too soon."